Chef Dominique Ansel and Monster High™ Unveil Exclusive Treat Just in Time for Halloween | Mattel, Inc.
NEW YORK--(BUSINESS WIRE)-- Monster High™ has partnered with Chef Dominique Ansel to create the Shocklette Monster, a one-of-a-kind treat just in time for Halloween. 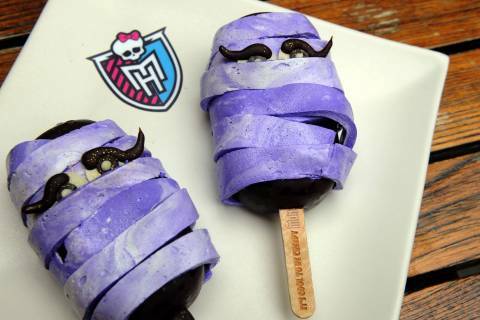 Just like the characters of Monster High™, Chef Dominique's newest creation brings freaky flavors together to create something even more scary-sweet -- reminding ghouls everywhere that it's cool to be unique. This unique fusion is a chocolate mousse served on a popsicle stick, dressed up in a crispy thin coat of dark chocolate and covered with Tahitian vanilla marshmallows bringing your taste buds back from the dead! The Shocklette Monster treat is not available at the bakery - but don't be scared! You can win one of Chef Dominique's other confections by sharing with @MonsterHigh what makes you freaky fab for the chance to receive your very own #MonsterHighTreat OR create a Dark Chocolate Mousse Pop at home! For more information about Monster High, visit MonsterHigh.com and follow on YouTube, Facebook, Twitter and Instagram. This Halloween create your very own Shocklette Monster with Chef Dominique's recipe for Chocolate Mousse! This is just the start -- the decorating is all up to your culi-scary skills. Show-off your Shocklette creations with @MonsterHigh for the chance to receive your very own #MonsterHighTreat by Chef Dominique! 1. Bloom gelatin sheets in ice water for 5-10 minutes. Wring sheets out to drain off excess water. Place sheets on top of chocolate chips. 2. Bring milk to a boil, then pour over chocolate and gelatin. 3. Stir mixture together until homogeneous using a whisk, to create a nicely emulsified chocolate ganache. 4. Cool chocolate mixture to just about room temperature (around 37C). 5. While chocolate ganache cools, whip your heavy cream to medium peaks. 6. Once the chocolate is at the proper temperature, fold into whipped cream. Add the ganache a little at a time to avoid deflating the aerated cream. 7. Once the mousse is combined and smooth, pipe into Popsicle molds and place the stick inside. 8. Freeze until set firmly enough to unmold. MONSTER HIGH and associated trademarks and trade dressed are owned by, and used under license from, Mattel. ©2014 Mattel. All Rights Reserved.